To manage and maintain the Loch Sport Safety & Water Sports Centre. To promote and encourage safe boating in all its forms, particularly on the part of its members. To promote social fellowship and marine-related recreation and sporting activities. Volunteers have been the backbone of the Loch Sport Boat Club since holidaymakers formed the club in January 1965. 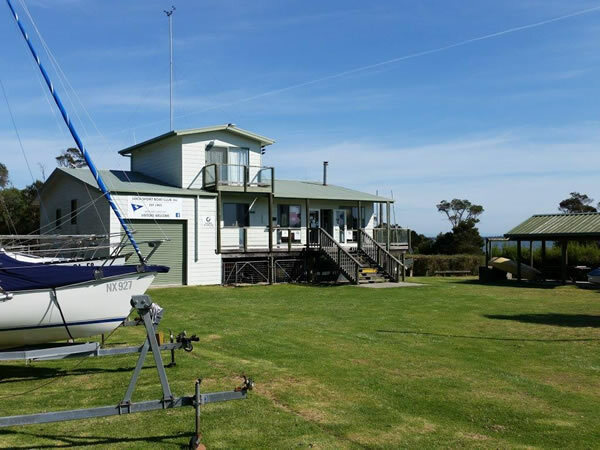 A dream to have their own clubrooms was perpetuated through members and committees over the years, and slowly the funds grew, for 27 years endeavours were made to overcome obstacles to find land to build on. Water skiing especially long races to Paynesville were early events of the club. Sailing dinghies were introduced with trailer sailors joining in the 1980s. The club has always encouraged family based activities. The club activities moved around the foreshore, hiring the old marina then the old hall, also gathering under the trees at the little jetty near the shop. Then behind the toilet block at the deep water jetty until a lease for the present site was finally granted in October 1992, this was not signed until September 1999, because of rezoning. In 1997 clearing began and an ATCO shed was purchased and used until the present building was ready. In early 2000 the plans to build the Loch Sport Safety & Water Sports Centre had to be revised due to the other organizations that had planned to share the building either going into recess or moving elsewhere. Members of the Boat Club decided to construct this smaller building themselves with the funds available, commencing in November 2000. More than 64 volunteers worked for many hours to complete the building within budget. Some building materials with furniture and electrical goods were obtained at discount rates or by donation. The building was officially opened in September 2001.